The State Fiscal Service of Ukraine (SFSU) is a key element of the civilian security sector in Ukraine. 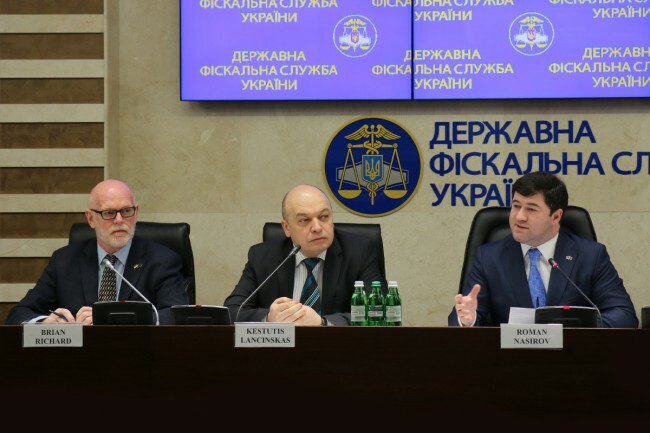 Assisted by its international partners, the institution is currently undergoing an important transformation to establish services that fully protect the economic security of Ukrainian society as well as combat illegal trafficking. This transformation involves a number of different stakeholders. To better coordinate the efforts to assist the SFSU with its reforms, EUAM recently initiated a Management Assistance Group, which met yesterday, bringing together institutions which share the common purpose of ensuring efficient, coherent and transparent public services in Ukraine. The Group has the stated objectives of facilitating the exchange of information on the current and prospective needs of the SFSU as well as identifying, discussing and addressing issues of common concern in the area of SFSU related management in Ukraine. The Group includes EU and international Diplomatic Representations as well as international organisations. Speaking at the meeting, EUAM Head Kęstutis Lančinskas underlined the significant challenges that the SFSU faces in not only providing much needed income to the State Budget of Ukraine, but also combatting sophisticated crime effectively. Alongside other members of the security sector, the SFSU has a responsibility for combatting smuggling, tax evasion, money laundering, organised crime, the chain of terrorist financing and other threats. “There is no doubt,” stated Mr Lančinskas however, “that Ukraine has enough professionals to create a team capable of becoming a driving force for radical reform of the fiscal services on the path towards a modern, transparent, efficient structure that will adequately meet the challenges of today”. The Head of SFSU Roman Nasirov made clear that SFSU was looking to its international partners to provide financial assistance to modernise its IT, provide training in law-enforcement, internal security, Authorised Economic Operators (AEO) and post-audit, as well as help improve Strategic Communication and HR business processes. Mr Nasirov also asked the international community for support in stressing the importance of certain SFSU initiatives to the Ukrainian government as well as the Ukrainian parliament. The meeting concluded with a commitment to improve the coordination and mutual information exchange between stakeholders and avoid any duplication of work. It was also agreed to establish the Management Assistance Group as a permanent structure with EUAM holding Secretariat functions.